Posted by Maggie Chen on Monday, March 28th, 2016 at 12:29pm. Eric Liftin of Mesh Architectures in NYC specializes in what he calls “reconceiving relationships between people and their environments in the age of the digital network.” Translation: His firm designs buildings and other “habitable spaces,” including websites, and is always looking to integrate the best new materials and technologies into its work. 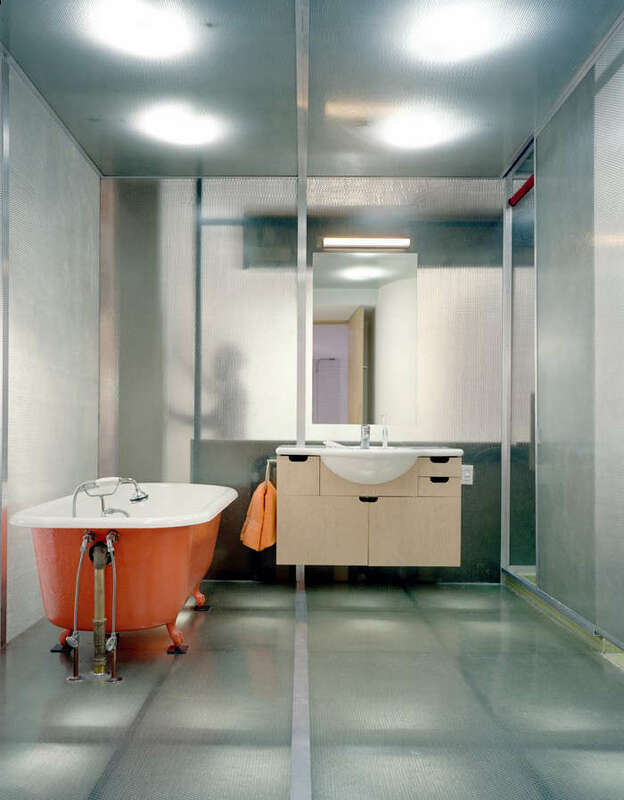 Above: Mesh Architectures built this loft bath out of fiberglass and aluminum Panelite that’s lit from below and above, creating a light-box effect in an otherwise dark space—and only elements close to the panels are visible on the outside. Go to the Architect Is In for a full tour. Photograph by Frank Oudeman. Thanks to digital printing, custom surfaces are now an option in all kinds of materials. Cheap and useful for counters and desks, laminate is making a comeback in guises your grandmother wouldn’t recognize. Wilsonart, in business since 1957, stands ready to turn your photos, illustrations, artwork, and logos into laminate. Go to WilsonartXYou, send in your design, and your free sample chip arrives in days. You can get your own images permanently baked onto ceramic tiles. Cafes and stores use custom tiles all the time. Take a look at Imagine Tile for DIY designs. (We also like Stonepeak for porcelain panels that mimic stone and Porcelanosa for porcelain flooring that looks convincingly like wood—good for kitchens and flood-prone locations. We love using custom wallpaper. It’s easy: For our condo building on the Brooklyn shore, we took a picture of the East River and made it into wallpaper for the lobby (see below). And for the Made in NY Media Center, we overlaid New York film stills into a wallpaper mural (it’s lit by colored LED bulbs that add a 3-D element to the viewing). The company we worked with, HD Walls of Rockaway, New Jersey, does all its production in the US, offers recyclable materials, and has a big library of its own customizable patterns. Above: You, too, can be a wallpaper designer: Mesh’s custom HD Walls wallpaper was created from a photo. We’ve been using LED lighting exclusively (except for in our office-made pipe fixtures) for a few years. Sometimes we select off-the-shelf fixtures, but much of the time we roll our own from LED tape—which is like masking tape that lights up. It comes in different shades of white and different brightnesses, and can be embedded into wall surfaces, so that lighting becomes a linear element integrated into the design. Above: A Mesh-designed kitchen with LED strip lighting incorporated into the ceiling. Photograph by Frank Oudeman. We use Environmental Lights’ White Single Row LED Strip Lights, Wall-Mount Adjustable LED Controllers, and Wi-Fi Compatible Dimmable Warm White Bulbs. For color-changing wall and ceiling lights, consider Environmental Lights’ ColorPlus LED Strip Light and Traxon Light Drive DMX Controller. The more consumer-friendly Philips’s Hue Lightstrip is also worth checking out. Two other favorites: USAI Lighting’s Warm Glow Dimming recessed lights. And Soraa offers the best LED replacement bulbs. We like the look of Adorne’s wall plates for switches and outlets. The switches use a wireless lighting system and have dimmers that adjust lights with the touch of a finger. Above: Adorne’s SofTap Wi-Fi Ready Dimmers, $120.50, can take the place of standard switches without complicated installation. There are a lot of smart locks on the market, but not a lot that are presentable. August‘s are pretty good-looking. Above: The August Smart Lock, $199, uses your smartphone as the key—and “virtual keys” can be created for guests (plus a round-the-clock activity tracks who comes and goes). These days double glazing is standard on the lowliest windows, and triple- panel is the state of the art for thermal insulation and noise reduction. The US is one of the last places where double-hung windows are typical. We use tilt-in windows, which are good for ventilation and easy cleaning, but most importantly actually seal when you close them. Above: Some windows are more than meets the eye—a cross-section of a triple-panel wood and aluminum Fusionline window from Gaulhofer. Our windows of choice? Gaulhofer from Austria, particularly the aluminum-clad wood version, which have, among other things, excellent “thermal breaks” to prevent the conduction of heat out the window in winter. Also Rieder windows, another Austrian import, are excellent, and they’ve been approved by the NYC Landmark Preservation Commission for landmarked buildings. And Yaro is another to know about; they offer an aluminum frame that the others don’t have. If you want to control solar heat gain, bleaching of interior materials, and/or glare, check out window film. New York Window Film is but one source. Our Atrium House (shown below) features a Greenscreen, a modular metal trellis. The house’s systems, including heat, lighting, and TV are all controlled from the owner’s iPhone via the Insteon System. Above: Atrium House, a Mesh garage conversion in Williamsburg.